^ Venn, J.; Venn, J. A., eds. (1922–1958). "Malthus, Thomas Robert". Alumni Cantabrigienses (10 vols) (online ed.). Cambridge University Press. 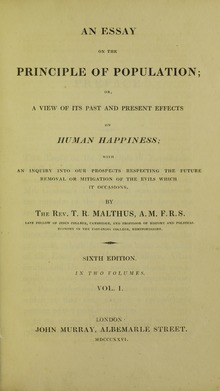 ^ Malthus T. R. 1798. An Essay on the Principle of Population. Oxford World's Classics reprint: xxix Chronology.